It is our pleasure to welcome a new guest to our blog. She writes under the nom de plume of Erato. Her latest book is a fictional account of the relationship between Prinny, the Prince of Wales and the infamous George Bryan ‘Beau’ Brummell. Why should a story about beauty and fashion be about a bunch of men? — When Beau Brummell takes centre stage, what else can the book be about? Many modern grooming habits, which we take for granted today, were established by Beau Brummell. These include the exclusively drab colours for men’s formalwear, the absence of lace and frills, and the practice of bathing daily. 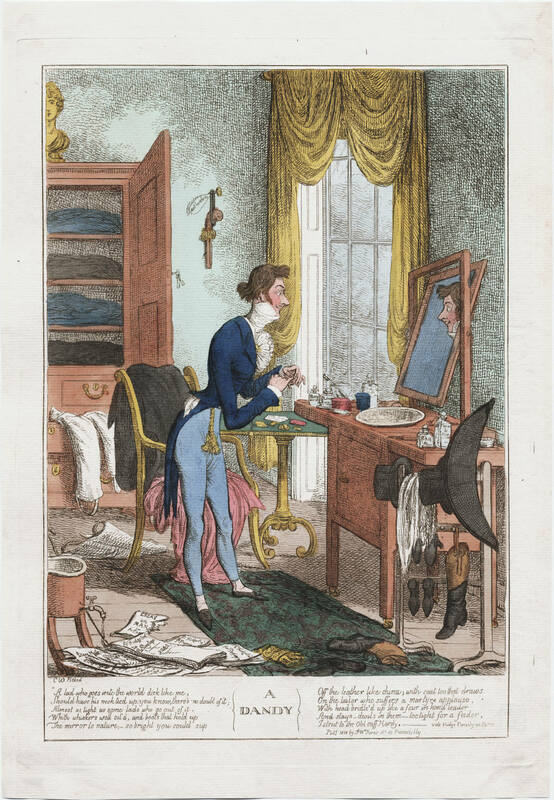 (Brummell’s bathing habits were so mystifying to the Regency gentlemen that they actually lined up at his house to watch him bathe every morning — a lengthy procedure, as the Beau was quite thorough about it, taking as much as two hours to complete his washing). The practice of social “cutting” was what led to perhaps the most famous piece of Brummelliana: when the Prince at last became fed up with Brummell’s insults, he cut Brummell, and made his decision clear at a party. He had lately won an almost unheard of £20,000 at the table. To commemorate this achievement, he and his core dandy friends were to throw an extravagant ball; one which I daresay must have consumed a goodly portion of the funds it was meant to celebrate having gained. Every body who was any body in the ton was to be there. Frances, Isabella, even Caroline were invited (though I understood the lattermost to have left the country for Italy by then, praise be to God.) Lord Byron would be there. Frederica and my brother were to attend. Not a name was missing from the guest list, but for one. It was mine. George Gordon, 6th Lord Byron, 1807-1809 by George Sanders. Royal Collection Trust. This was surely no oversight; the Beau must have known I had cut him, and have therefore influenced his friends (with whom I was still connected) not to invite me as any guest of their own. And yet, as Prince Regent, I did not need an invitation. It was like a modern droit du seigneur: if I chose to attend at any ball or assembly, invited or not, it was considered an honor to the hosts to have me there. Naturally, Mr. Brummell was to be at this event, and I surely had no desire to see him again; but I took into consideration how many others whom I dearly loved and wish’d to see, would be there. Was that wretch to deprive me of my company, of my happiness? Never! I wrote to the hosts of this party, announcing my plans to attend notwithstanding their little oversight about inviting me. There was no need to ask their permission. George IV when Prince Regent by Sir Thomas Lawrence, 1814. The fashionable Argyle [also Argyll] Rooms had been rented to accommodate this glorious event. It is a most splendid location: the entrance hall is painted with frescos of Corinthian pilasters and compartments, footed with green marble. It was there, waiting to greet the guests, that I saw my four hosts in all their tasteful finery: Alvanley, Mildmay, Pierrepoint and, naturally, the Beau himself. They were lined up, two to each side, in suits so well tailored that there was not a single wrinkle between them. It was my polite duty to greet them. I began at the left side, speaking first to Mildmay; then across to Pierrepoint. Beside him was Brummell, eyes glaring at me despite his false smile. I passed him over, making every display of not having noticed him at all, as if the man were no more visible to me than a f–t. People around us saw what I had done; I could feel a sudden chill to course through the whole room. I had just affronted the great Beau Brummell, and made known to everybody my cut of his company. I crossed back to the left to greet Alvanley, and that done, was about to make my way up to the vestibule and stairs. Aw, Alvanley, who is your fat friend? Every person who stood in that passageway cringed. There was a moment of silence as nobody knew what to do. Then I heard, dreadfully, the rising sound of a giggle: a crescendo that soon became a mighty roar of laughter. Everybody was laughing, and this delight was being had at my expense. Brummell was plainly quite pleased with himself to have thus humiliated me. If you have ever wondered “Who was Beau Brummell?” then you might like to read the account of his reign as the king of fashion in The Cut of the Clothes. Interesting. I do think that Brummell rode the wave that was already making changes in clothes. Women’s clothes were changing so it was logical that men’s would follow. There is a book about the Three Piece Suit that speaks more to the evolution of men’s fashions. The relationship between Brummell and the Regent was bound to fail as both were great egotists. Agreed 🙂 Thank you for sharing the details of the book too, we’ll be sure to look out for it. There’s also another great factual book – Prinny’s Taylor: The Life and Times of Louis Bazalgette (1750-1830) by Charles Bazalgette. Ian Kelly wrote a biography of Brummell which was made into a movie. Jesse wrote a biography about a hundred years ago as well. That is the basis for most tales about Brummell, I think. Rosemary Stevens wrote a series of mysteries with Brummell and his cat as detectives. Unfortunately the publisher didn’t want to continue the series after about 3 books. Those mysteries are the only books I have ever read that made Brummell a sympathetic person to me. I think Brummell thought more of himself than of anyone else. A bath everyday for men, whether they needed it or not? Brummell was both a genius and a risk taker.